On some Ubuntu installs with two or more keyboard layouts (e.g. Russian and US English), after some time the keyboard layouts start switching in an endless loop and gnome-settings-daemon starts using more and more CPU until it reaches 100%. 2) Possible fixes are killing and restarting gnome-settings-daemon or disabling the "Separate layout for each window" option in keyboard preferences window. 3) The second fix, however didn't work for most people, though it might really reduce the probability of the bug appearing. 4) The bug happens both on upgrade installs and clean installs of Ubuntu, confirmed with RC and Alpha 3. 5) The bug is specific to Ubuntu, not existing in Arch Linux and AgiliaLinux. 6) There are users who experience this problem with Russian, Slovakian, Macedonian, Hebrew, Georgian layots. Having such a problem in final release will make keyboard use very problematic for users from these countries, so Ubuntu can lose many users. 7) The bug is still not fixed in GNOME 2.32, which again proves that it's an Ubuntu-specific issue. 8) For some users, the bug disappears after 2 to 15 minutes of use. 10) Confirmed for both Latin and non-Latin layouts. 11) Permanent fix is to disable g-s-d keyboard plugin in gconf, not fully confirmed though. 12) Confirmed as a g-s-d issue, both with and without indicators. P.S. Do. Not. Touch. This. Please. There's more info here, which can make the devs remove the Incomplete status. Не трогайте это, пожалуйста. Здесь намного больше информации, чем во всех предыдущих описаниях, может снимут Incomplete. TO DEVELOPERS: Please, comment on what logs and other info you need to get this problem solved. I attached video with login screen where you can see this bug. Language changing without my activity. And i can't login because of this bug. I can see this behavior after language applet added in maverick. Can either of you determine the trigger for the bug? Does it seem to be doing it without a trigger? That would be impossible I think, but the indicator applet does respond to certain X events so I could investigate those. Unfortunately I can't seem to watch the video, will try with some other players. I don't know what's happend, but it appears few times every day on all my computers. It appears as if this is a gnome-screensaver dialog, I'll reassign this to gnome-settings-daemon as it's not related to the indicator itself. @Yura, could you also tell me what your current keyboard shortcut for changing layouts is? @Yura, could you change it to left + right alt, or another combination of two keys and see if it keeps happening. It could be a few things, possibly a keyboard error, possibly an accidental press of the key, if the shortcut is changed we'll have a better idea of what might be causing it. Well, I can't see what of my work might have made this happen, so I think this *might* be an upstream bug. If this is an upstream bug, could somebody having the issue send it to bugzilla.gnome.org ? Thanks in advance. ignore that I didn't read the new comments before posting, do you have steps to trigger the bug? It happens over 10 times in a day. The keyboard layouts change themselves over 10 times in a second. I have the English and Macedonian layouts, and I switch the layouts with ALT+Shift. Switching the layouts seems to trigger this bug, and killing the gnome-settings-daemon process is solving it. I can properly switch between my two layouts when the gnome-settings-daemon process isn't running. We use the Cyrillic alphabet like the Russians too and maybe that too matters something, because I don't see any non-Cyrillic user who is affected by this bug. Btw, I use Maverick x32 Beta (the bug had the alpha3 version too). Comment #24 seems to be the CPU hogging bug, this should have been fixed and a the fix released. Can someone confirm what is exactly happening here? Does it suddenly change to a different layout and remain at that layout? Does it continuously change quite rapidly? It changes continuously vary rapidly (e.g. I see gxneur country flags changing very rapidly). At the same time the process gnome_settings_daemon is shown in system monitor to use more and more memory (I saw up to 800-900 mb). It doesn't stop without killing the gnome-settings-daemon. ADD: And I don't see how to reproduce it. But I feel like it has more chances to occur if you work with editors and enter a lot of text. ADD2: When it happens, you can-not change or launch anything through popdown kb-menu (but you can see it with no lags). I.e. keyboard preferences get also blocked. shoo what version of gnome-settings-daemon do you have? I reproduced this once, fixed what I thought was the bug and released the fix. Yes, not only indicator text/flags does switch, but also layouts are switching, so if you have, for example two layouts - English and Russian, with letters 'q' and 'й' on the same key - and want to enter 'qqqqqqqqqq', the output will be 'qйqййqqййqйqq`. The indicator image(I use country flags images) also change it's image about 10-30 times per second, sometimes faster, sometimes slower - I guess it depends on system CPU usage. When the option 'Separate layout for each window' is disabled, the bug doesn't occur. (I tested it on two machines with latest Maverick beta). Karl, I can provide any info that will help to find the source of the problem, just tell me what info is needed. My system was upgraded from the previous version of Ubuntu (lucid lynx) I am wondering if it can cause the problem and it works with a 'clean' install (ie: new home directory with gnome/etc settings created by the current development version of ubuntu). I have four layouts configured, one of them (USA) is the primary, the others are configured to be signaled by the scoll lock led, and I switch layouts by key "scroll lock". I have version 2.32.0-0ubuntu1 installed. I found how to reproduce the bug. You should have several layouts and any open window with text-input (eg gedit). So try to minimize and restore the window, at the same time change the layout with a key combination (several times) - il will reproduce the same bug, the layout change will come to infinite loop. I can make a video for you, if it is needed, with this bug reproduced. > I am wondering if it can cause the problem and it works with a 'clean' install (ie: new home directory with gnome/etc settings created by the current development version of ubuntu). I've got clean install since last alfa or beta. I've submit new bug report with apport after i had to kill g-s-d again. I hope additional information from apport help you to fix this bug. @divan: Could you clarify exactly how you set up your keyboard layout indicator to show country flags? One problem I've been having (at the same time as this random layout switching bug) is that I am no longer seeing any indication of my current keyboard layout at all. All I am now seeing is an icon that looks like a keyboard, with a cable trailing off into the distance behind it — and this icon stays the same no matter which layout I am using. I'm not certain if this indicator problem is related to the random layout switching problem or not, but (at least for me) both issues arose at the same time, so I'm suspicious. I've reported the indicator problem separately as bug #650166. @Rich Wales, copied flag icons(from internet) to ~/.icons/flags and set the option /desktop/gnome/peripherals/keyboard/indicator/showFlags to true, but I don't think it matters, cause people reported this bug with text indicator as well. Happens with clear install of 10.10 RC too. Layouts keep changing very quickly but then stops in 2-10 minutes, shortly this problem appears again. Ok, I *can* upload this, so I've just uploaded it to maverick-proposed. Great, thanks Chris. This bug was proving illusive to me. Had this bug too. Is this reproducible on the system without Compiz enabled? 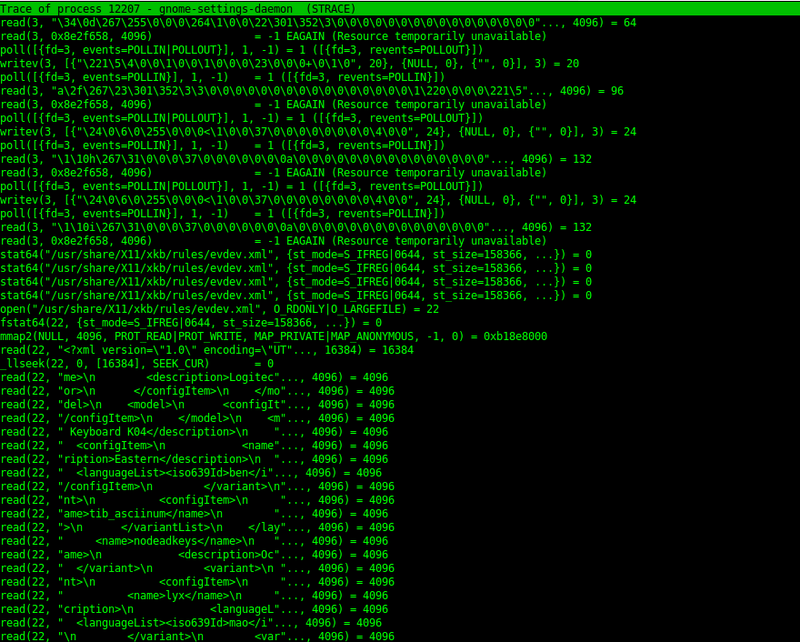 Hello Karl, I'm using your repository, you delete gsd from it, what does this mean? Package from maverick-proposed fixed problem, thank you! You all say that you still experience this with 2.32.0-0ubuntu4. Please write if it still exists. Don't forget to restart your session first. I will see if it suddenly reappears, but I believe it won't. @Dmitry Shachnev i was able reproduce bug in 2.32.0-0ubuntu4 (and ubuntu3 , ubuntu2 from Chris Coulson). gnome-settings-daemon_2.32.0-0ubuntu3 from maverick-proposed work fine, no bug. Just updated from lutsid. Bug is missing. Thank you for fixing. In general, it is a strange situation, which has received less attention than it should. - set key for change (rotate) layout, i.e. "k"
That always get a bug in my Maverick. AFTER update no bug, thanks. ‌Bug still here after enabling proposed repo and running sudo apt-get install gnome-settings-daemon/maverick-proposed (2.32.0-0ubuntu3). @Mehdi: You need to either logout and re-login, or just restart your computer. In this way, the updated gnome-settings-daemon will be used. Can you confirm whether you still get the regression, even after you re-login (or restart)? some cases it appeared after 3 or 4 hours of use. > computer. In this way, the updated gnome-settings-daemon will be used. > of a duplicate bug (656988). I do not see this bug any more after maverick-proposed. But I noticed the next: after reloading the system, indicator shows the layout "USA", but really it is german layout. I need to switch the layout several time to get it USA again. Not sure, it is related to this bug. @Anton, can you experiment and find more detail here, I think it's not cycling through them correctly. @Anton, Same here it often happens when screen is locked. I see layot is USA and tape my pass, but it says wrong password. Then i should change layot again until i see USA. After this i can login. I have a German system, but default language is USA. When the system is loaded, indicator shows right layout - USA, but it is not really USA, it is DE. I think it is possible to reproduce the bug using another languages as well: RU + USA or others. Ok. So the package from maverick-proposed works fine for all. I change status in AppIndicator to invalid because it doesn't need fix. this bug by turning off "Separate layout for each window"
This package is still in maverick-proposed now. Release of the fix will be tomorrow? First: The bug is invalid for the upstream gnome-settings-daemon because it was introduced only in ubuntu's patched version. Second: It was fixed in gnome-settings-daemon - 2.32.0-0ubuntu3. Check your version (using synaptic for example). If it's older, update. Third: The bug was introduced on 10.10 not 10.04. As far as I know it was never experienced on 10.04. Make sure you are not experiencing another (new) bug. As all 300 people who have been originally affected do not complain anymore, it may be better to fill new bug report. That will keep this report clean. It will also help you because the devs will have easier time tracing and fixing it (here we already have ~300 comment, no one can find the useful information here). If you are sure the two bugs are connected, add a link to this one in you new bug report. Patch for Baltix is already released? Also this bug affect's me. I have ubuntu precise 12.04 amd64. E.g. some process use to many memory. After killing this process I get gnome-settings-daemon that uses 100% cpu. But I have num lock swtching instead of kb layout switching. 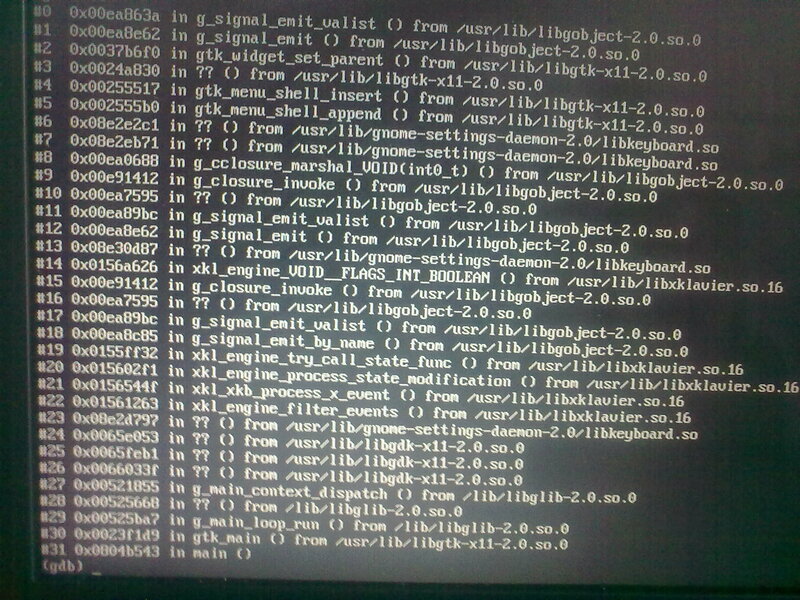 Installed cinammon on ubuntu 12.10 and now it started to happend. That's weird, it did not happen to me when I installed 12.04. Did happen on 11.10 but it was fixed after an upgrade (when the fix was released). Displaying first 40 and last 40 comments. View all 268 comments or add a comment.